In 2016, Nebraska implemented an Aquatic Invasive Species Stamp to fund programs aimed at combating aquatic invasive species. Residents do not need to purchase a separate AIS Stamp. They will pay the AIS fee when they register their boat and provide that proof when affixing the boat registration number on the boat. The AIS Stamp can be purchased online through our permit system. Select “Non-Resident Boat AIS Stamp” at the bottom of the permit system page. 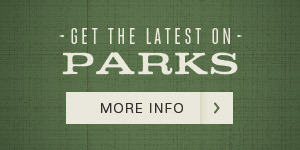 A temporary stamp may be purchased at some state parks and recreation areas. What is the fee structure for the Aquatic Invasive Species (AIS) Program? Motorized watercraft registered in Nebraska will be required to pay a $5 fee in addition to the 3-year registration fee. Motorized watercraft registered in any other state will be required to obtain a $15 AIS stamp annually. What will the AIS stamp fees be used for? Fees collected, as authorized with the passage of LB 142 by the 2015 Legislature, will fund the newly created Aquatic Invasive Species Program in Nebraska. These fees will pay for programs to educate the public about AIS, prevention efforts to keep AIS from being introduced into Nebraska such as monitoring waters across the state, inspection and decontamination of conveyances, treatment for AIS populations, and other AIS projects as needed. Why are only boaters being charged fees to support the AIS program? Watercraft are the primary means that AIS, especially zebra and quagga mussels, are transported and therefore are the greatest risk for spreading AIS to and within Nebraska. There are confirmed waters in Nebraska that have invasive mussel populations and other AIS. All watercraft present a risk for transporting AIS. It is very important for all boaters and water-based recreationalist to follow the Clean, Drain, Dry protocol. When and where can I get a nonresident AIS boat stamp? On or before January 1, 2016 nonresident boat owners will be able to purchase this annual $15 stamp ($13 plus a $2 issuing fee) at Nebraska Game and Parks Commission permitting offices, over the web or through permit agents like Walmart. What happens if I lose the boat stamp? If you lose a stamp, you will be required to purchase a new one. Duplicate stamps will not be available. How long are AIS stamps valid for? Nonresident AIS boat stamps are valid for one calendar year; they will expire on December 31 for each year purchased. Resident boat registrations (which will include the AIS fee) are good for three years. When will I have to start paying the new AIS fee? Starting January 1, 2016, residents renewing or registering their boats will pay the new AIS fee; nonresidents will be required to have the new AIS stamp affixed to the boat prior to launching in Nebraska waters. Where do I place the AIS stamp on my watercraft? 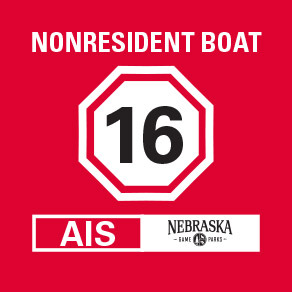 For all nonresident watercraft launching into Nebraska waters an AIS stamp must be displayed on the starboard (right) and rearward side of the boat and above the water line so it can be observed while in the water. Why don’t residents need a decal on their boat? Residents pay the AIS fee when they register their boat and provide that proof when affixing the boat registration number on the boat. Does the AIS stamp indicate a watercraft has been inspected? No, an AIS decal is not proof a watercraft has been inspected. The stamp is a funding mechanism for the AIS program. Is it a violation not to have an AIS stamp on a non-resident motorized watercraft? Yes, Nebraska Game and Parks Commission regulations require that all nonresident motorized watercraft have an AIS stamp prior to launching on or entering into the waters of the State. When a watercraft with a current nonresident AIS stamp changes ownership, does the new owner need to purchase another AIS stamp? No, the AIS stamp remains attached to the watercraft and is valid for the remainder of the calendar year. Do I need a nonresident AIS stamp to launch my boat on border waters such as the Missouri River? If the boat is launched from a Nebraska boat ramp facility an AIS stamp will be required.